Author of "A Christmas Story"
In 1983, Jean Parker Shepherd (1921 - 1999) wrote the film "A Christmas Story." It is one of the most loved and watched holiday classic movies. Born in Hammond, Ind., Jean became one of America’s top writers, comedians, actors and radio-television personalities. He graduated from Hammond High School in 1939 and then went on to serve in the U.S. Army Signal Corps, throughout WWII. It was during his time in the U.S. Army that he became captivated by radio and storytelling. His career began in radio broadcasting in 1948 with a Cincinnati radio station, which led him to New York City. Jean’s hometown and his life growing up in Northwest Indiana were the inspiration that he used repeatedly for his many humorous short stories and in his radio broadcasts. Many of these short stories were published into popular books. As an acclaimed writer, his stories found their way onto both the small and big screen. The most recent movie, “A Christmas Story,” hogs the spotlight of his successes, but wouldn’t have been possible without his stories and radio broadcasts. In this movie, Jean narrates the adult voice of the infamous main character, Ralphie Parker, who wants a Red Ryder BB gun for Christmas. 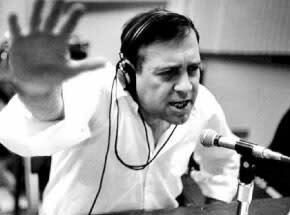 This legend set the stage for radio and storytelling that made his style unique, and is still being imitated today in film, radio and print. His legacy, “A Christmas Story,” and his distinctive storytelling style will stay in the hearts and minds of the nation, especially the residents of Northwest Indiana. Every November and December, the Indiana Welcome Center in Hammond provides its holiday exhibit of Jean Shepherd’s “A Christmas Story” with six animated window displays from Macy’s in New York. He was inducted into the National Radio Hall of Fame in 2005. 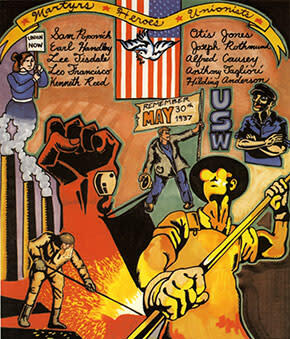 A critical event in labor history galvanized national public opinion on May 30, 1937. The Memorial Day Massacre occurred in which ten men were killed by Chicago police at Republic Steel Corp. in South Chicago. Throughout the 1930s, thousands of workers across the country were using sit-ins and peaceful demonstrations to act out against unfair wages, dangerous working conditions and unpredictable employment. On Memorial Day, May 26, 1937, Republic Steel workers, women and children along with hundreds of other unarmed steelworkers and supporters, marched peacefully, fighting for their rights to form an organized union at Republic Steel in South Chicago, before being beaten and shot down by police. Many people were injured and 10 were killed, including Northwest Indiana residents Sam Popovich, Earl Handley and Kenneth Reed, former members of the United Steelworkers Local 1010. In addition, Hilding Anderson, Alfred Causey, Leo Francisco, Otis Jones, Joseph Rothmund, Anthony Taglieri and Lee Tisdale were also killed. The acts and deeds of these steelworkers, who lost their lives in the pursuit of a better life for both their families and their communities, helped improve the standard of living for all who are part of a union. The world is a different place now because these men stood up for what they believed in and their dreams of the working class becoming a reality. Today, there are unions across the country and the world. The Tuskegee Airmen were the first African-American military airmen to serve in the U.S. Air Force. These brave men fought not only in World War II, but battled racism, segregation and humiliation to pave the way for equality and freedom during the 1940s. African-American airmen were trained at Tuskegee Army Airfield (TAAF) in Tuskegee, Ala. A total of 994 Tuskegee Airmen graduated from TAAF from 1942-1946. Out of those 994 airmen, seven residents of Lake County, Ind. earned their pilot’s wings. During World War II, the U.S. military was racially segregated. African-Americans could only serve in labor and support positions and only with other African-Americans. At the beginning of WWII, the U.S. military enforced the belief that African-Americans did not have enough intelligence to become pilots. Because of the efforts of the Tuskegee Airmen, the military policy was changed. These men served with honor in combat which eventually led to ending segregation in the U.S. Armed Forces. Even though the Tuskegee Airmen overcame racial stereotypes in the war and flew bravely and successfully, they still endured racism and segregation after the war ended. In 1948, President Harry Truman signed an executive order which stated equal treatment and opportunity for all of the United States Armed Forces. 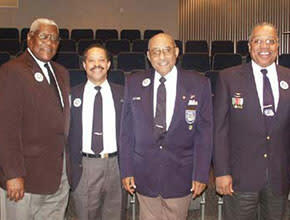 This ended racial segregation in the military forces and was a first step toward racial integration in the U.S.
On March 29, 2007 at the U.S. Capitol, President George W. Bush honored 300 Tuskegee Airmen with the Congressional Gold Medal, the highest civilian award given by the U.S. Congress. We honor the seven residents of Lake County, Ind. who earned their commissions and pilot&apos;s wings at Tuskegee: Rixie McCarroll, Gordon M. Rapier, Carl F. Ellis, Louis U. Murray, Quentin P. Smith, Lloyd McKeethen and Sylvester H. Hurd. Their legacy lives on!